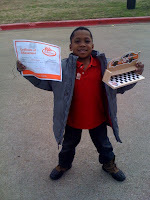 Lamarcus, Joshua, and Hakim attended the "Kids Workshop" series at Home Depot with Mr. Phillip and Mr. Casey. For the first workshop the boys made a car display rack. Check out the pictures below. Next month, they will be creating rain gauges. This is terrific, Janet. What a great opportunity for authentic learning. Thanks for sharing! That looks like sooooo much fun!!! I think I may want to go next time! 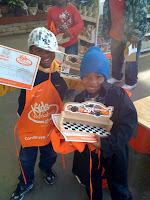 It looks like you did a really good job of creating your car display rack, Lamarcus, Joshua, and Hakim! GREAT JOB! !